It was finally time to get down to business. Today promised to be a long day of hiking. Based on the snow level at camp last night, I knew we’d be wading through snow all day today. I chose a summer hike that held some potential for winter exploration, but I had little idea of what to expect. We drove towards the McClellan Mountain Trailhead with the ambitious goal of hiking to McClellan Mountain and the more practical goal of reaching Fields Peak. Since we didn’t roll out of camp until 10am or so, I ratcheted down our plan to get as close to the summit of Fields Peak as possible. We parked the car at a bend in the road where the snow began to deepen and the grade of the road ticked up a notch. Here we packed up and bundled up for a cold day. The sun was shining and the snow was light under our feet. We began walking uphill in the snow, aided by snowshoes. In less than an hour we reached the actual trailhead. I guessed the road walk added about 2 miles and a couple hundred vertical feet, round-trip, to our 4.6 mile, 1850′ elevation gain hike. The trail was very easy to follow even under the snow. Aaron and I took turns breaking trail as we walked in and out of the trees. The desert forest was open and sunny, with views of the surrounding valleys and ridges at several points of the hike. Once we started getting views of big mountains ahead, I began getting excited about the prospect of reaching a summit. The first real view of what looked like a mountain ended up being Moore Mountain, which was not on the day’s to-do list. I was pretty disappointed. Moore Mountain’s bare, white flanks glistened in the sunshine and just beckoned for exploration. But, I wanted today to be a success and I thought that Fields Peak was our best bet. We continued along the trail, watching the trees get smaller and more twisted, as anticipation started to build. I’ve always enjoyed the excitement that comes from leaving the comfort and safety of the trees and entering the vast, open unknown. As we left the last gnarled tree behind, we entered a Martian landscape of wind-scoured snow dotted with tiny branches from the rugged shrubbery lying just beneath the surface. We cinched down our jackets tightly as we faced into the wind and kept pushing up. The trail spiraled up towards the summit. It re-entered a stand of trees and got steeper. Once the summit cairn was in view, we left the trail behind and angled straight up to the top. The combination of blinding sun rays, steady wind and bitter cold made it feel more like the summit of Everest than a 7000′ bump in the Oregon desert. But it was precisely the combination of wild, wintry conditions and the exhaustion of a hard day’s efforts that made the accomplishment feel so sweet. We celebrated on the summit after putting on extra warm layers and taking lots of pictures and videos from where we stood. We happily shared steaming, hot chicken soup from the Thermos I’d carried up there. The rest of lunch would have to wait until we were out of the wind. Once my SPOT message sent, we hurriedly left our prize behind and headed back to the relative safety of the trail in the trees. As the conditions returned to warm and sunny, we stopped to take many more pictures of the rime-crusted trees, sweeping mountain vistas, and glistening snow. We devoured our PB&J sandwiches and basked in the warmth of the December sun. The hike out was great. It was all downhill and the trail was already broken. We were riding high on sugar and the success of our summit. We arrived back at the car five and a half hours after we began. Three hours of driving brought us through Burns, Oregon (the next Bend, I hear…) to Crystal Crane Hot Springs in Crane, Oregon. I went here last year for a soak and I finally had a great excuse to go back. We arrived well after dark. The cold air outside of the hot car was surprisingly exhilarating and hit me like a ton of bricks. 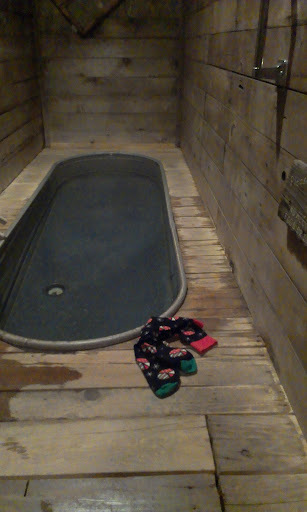 I rushed inside to reserve a private tub room and soon we were in hot springs heaven. For $7.50 each we got to soak in our own private little hot tub room, fed by the natural springs outside. Days of sweat, grime and soot blissfully melted away. After the soak—a shower—then it was off to find a camping spot for the night. I remember having a hard time finding forest land near Burns so we drove back up 395 to a Sno-park/Campground called Idlewild. It was empty, of course, but the little car made it through the snow to a campsite so we called it good here. By 10 pm or so we were finally settling down to a home-dehydrated meal of beans, pasta and ground beef. It tasted gourmet. It would be a cold night but I’d strategically planned a lazy start tomorrow morning so we could stay bundled up in our sleeping bags as long as we wanted. View all the photos on Picasa. This entry was posted in General, Hiking, Oregon and tagged hike366 on December 22, 2012 by Jess B.